Please refer to our stock # B-14 when inquiring. "The Art of Rosanjin" by Sidney Cardozo and Masaaki Hirano. 1987 First Edition, Kodansha. Hard cover with original plastic dust jacket. Condition - New. 163 pages. Includes numerous color and B/W plates, illustrations, and writings of Rosanjin's works and essays. "Genius walks hand in hand with eccentricity. Rosanjin had both and more. Well after his death, his art and, equally important, his writings on art and life provide inspiration and sustenance for the art lover, aspiring artist, and sensitive reader." 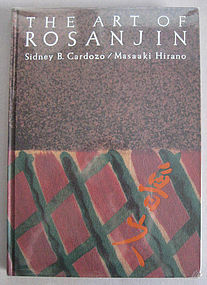 Sidney Cardozo was a close friend of Rosanjin's and has frequently served as an advisor to galleries and museums on the subject of Rosanjin and has published widely on the artist.He was educated at Dartmouth and has enjoyed a long career as a journalist, lecturer, editor, and has formed an outstanding collection of Rosanjin's works. Masaaki Hirano was also a friend of Rosanjin's and was also his secretary for four years. He was a graduate of Waseda University and a respected scholar and essayist on the history of Japanese culinary arts. He also compiled the 1500-page "Collected Works of Rosanjin," the definitive collection of the artist's writings.